Monday September 21st we went to Bork Viking harbour to get the feel of Viking life in action. 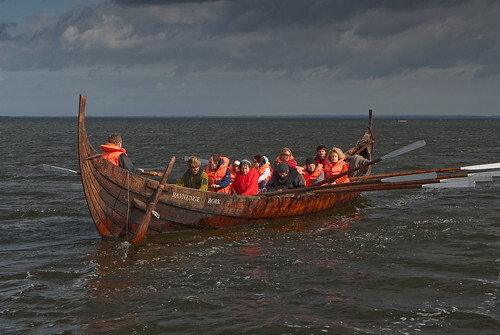 The boat we were taking out was a replica of Skuldelev 6, called “Ravnunge Bork”. The boat is meant for a crew of 7-16 men, our crew consisted of 2 experienced Vikings, one professor and 9 students, a good number for working this boat. Number one rule when rowing, do not stare at your own oar, instead look at the person in the back on starboard side setting the pace. It was, of course, of great importance that we all were rowing at the same pace. Not doing so might have caused problems such as hitting the person in front, in the back or on the side of you, or their oars. With a bit of practice we all got into it. I do not know if we reached the expected speed of the boat, that is 4 knots, but we got it going. From the harbour in Bork we rowed out along a stream on to Ringkøbing fjord, on the way out to the fjord we past a sacrificial site with dead animals on display, the Vikings had been there…..
Out on the “open” fjord we all tried out our skills as coxswain, commanding the rowers to steer the ship around a buoy, who should row forward and backwards to make the turns more sufficient. After a few tries we got the hang of that too and learned that it is even more efficient to use the rudder for steering rather than just the oars. Setting sails we have not done yet (well, only on dry land), the winds have been too strong, but next week we will also get to sail the Viking way.